NHL News : Rumor: Kane for a 1st round pick and a prospect? Rumor: Kane for a 1st round pick and a prospect? 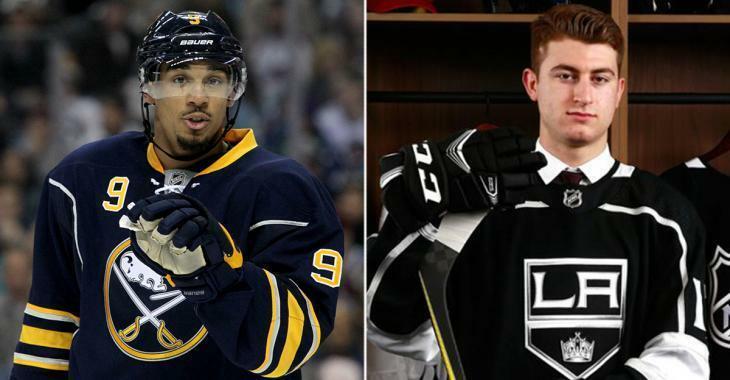 Should the Sabres make this deal? On CBC’s Saturday Headlines segment during last night’s Hockey Night in Canada broadcast, NHL insider Elliotte Friedman reported that the Buffalo Sabres are taking offers on “anyone not named Jack Eichel.” This, of course, includes mercurial winger Evander Kane, who has been at the center of trade speculation for months. What’s even more interesting is that Friedman shared some information from two sources that reveals the Sabres asking price on Kane. “Winnipeg got Marko Dano, a first-round pick, and a conditional pick for Andrew Ladd from Chicago, and Arizona got a first, a second and a fourth from Minnesota for Martin Hanzal and Ryan White,” said Friedman. Could Sabres GM Jason Botterill hold out for a similar return? The argument could be made that Kane is a more valuable player than either Ladd or Hanzal, so Botterill is certainly well within his rights to ask for a premium. What’s interesting though is the amount of teams who will be taken out of the Kane sweepstakes if Friedman’s report is to be believed. Would a rebuilding team like the Vancouver Canucks be interested in trading so many future assets in a deal for Kane? Ditto for a team like the Detroit Red Wings. It’s even more difficult for a team “stuck in the middle” like the Los Angeles Kings or San Jose Sharks. Both teams could use and infusion of offence up front and seem like a perfect fit for Kane. But, both teams are also thin in terms of prospects and need to manage their picks appropriately or they’ll risk a HUGE drop off in the next few seasons.